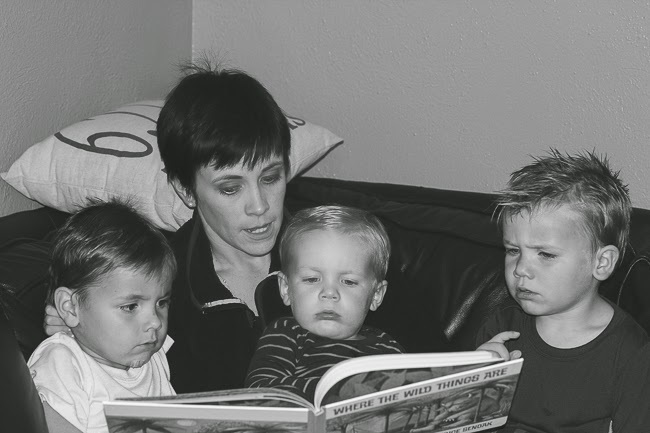 I'm rarely in front of the camera, so as I was reading a night-time story to the boys, Jeremy snapped this shot. And, what I've noticed in these photos is that 90% of the time I'm in my maybe 10-year-old Patagonia fleece. It has teeny tiny holes in the sleeves, and it's super thin. But, there's just something about it. It keeps me warm/cozy. It's part of my daily life at home usually. Maybe that's a sign that I need to change things up a bit! These guys are just getting to where they love a good book. Really, it's still just Carter that sits and listens. But, Peter loves to ask questions. And, John Paul enjoys turning the pages. So, it's a team effort. We've gotten a lot of new books lately for birthdays. Some of our latest favorites are Harry the Dirty Dog, Frog and Toad, Madeline, Corduroy, Stuck, and Little Blue Truck. Ana had a list last week that we're checking out soon! What are some of your favorites? Little Blue Truck is one of our favorites!! Anything Dr. Seuss :) Lately it's been all about Fox and Socks. Lately it's been a lot of Franklin books... I like them, but I'm ready to be asked to read something different! We read a TON of books around here. Our tots' favorites… Tip, Tip, Dig, Dig. Digger Man. Bear Snores On. Brown Bear, Brown Bear. Anything Karen Katz. Dr. Seuss. We also have Where the Wild Things Are. So many fantastic reads… You are setting a great example by reading to your children - they'll be lifelong readers! Our girls are loving Madeline, Frog and Toad, and Corduroy too! I'll have to look at that Little Blue Truck. They also love Strega Nona, Minnie and Moo, and Amelia Bedelia these days. P.S. 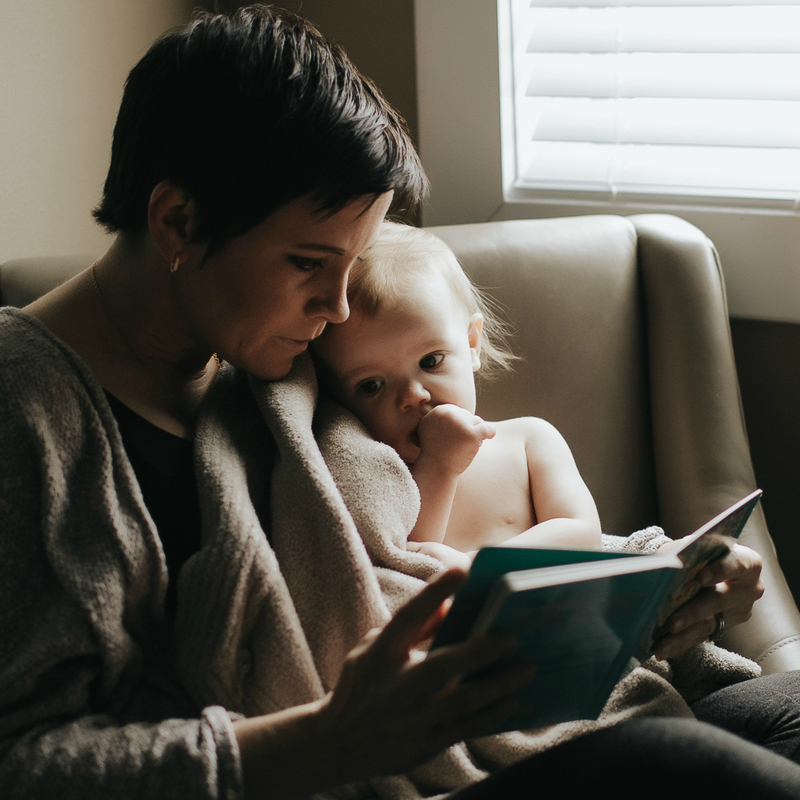 I LOVE pictures of parents reading to the kiddos. So precious! A favorite right now is "Mighty Dads." Our son is two, so the words are limited in each page, but I love how dads are revered! He is obsessed with anything construction or tractor related, so this is perfect. Britt, this might be WAY more information than you need, but your question really threw down the gauntlet down to a children's librarian. Hope these prove useful. Enjoy! Tiny Saints: http://shoptinysaints.com I think I’ll have to pick up a Joseph, now. Christopher looks very good on my keychain!